Notre Dame Must Vacate 2012, 2013 Football Wins Over Academic Violations : The Two-Way The NCAA says a former student athletic trainer violated ethical conduct by completing coursework for football players. The Fighting Irish say they will appeal the NCAA's decision. 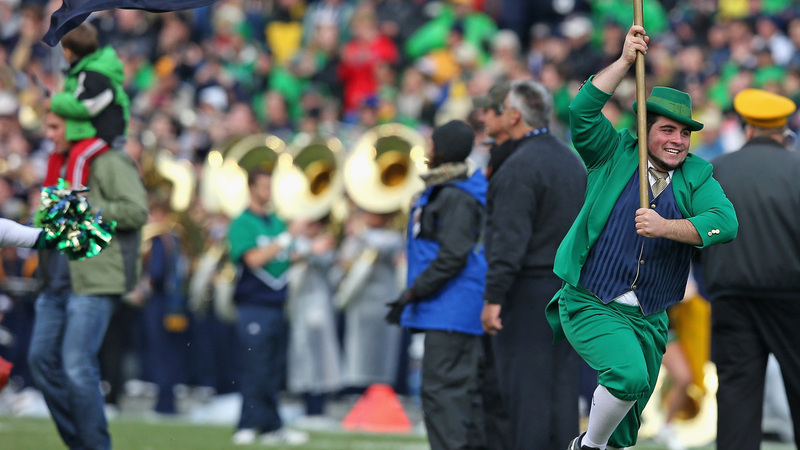 The Notre Dame Leprechaun mascot runs onto the field before a 2013 game between the Fighting Irish and the Navy Midshipmen at Notre Dame Stadium in South Bend, Indiana. Notre Dame defeated Navy 38-34. The school has been ordered to vacate all its victories that season, as well as those in the season before. The University of Notre Dame must vacate two seasons' worth of football victories because of academic misconduct by a student athletic trainer, the NCAA announced Tuesday. The affected seasons are 2012-13 and 2013-14. The university has also been slapped with a $5,000 fine, a year of probation and public censure. The former student trainer must cut ties with Notre Dame's academic program for two years, and if she's hired in an athletic role at an NCAA member school during that time, she must appear before an NCAA panel. "The school ripped the NCAA for its decision to strip the wins, which included the best season of coach Brian Kelly's tenure in charge of the storied program," The Associated Press reports. "The Rev. John Jenkins, the university president, said the NCAA has never before vacated the records of a school that had no involvement in the underlying academic misconduct." Notre Dame says in a statement it will appeal the decision, arguing that the student in question committed intellectual dishonesty on her own and that the school "investigated aggressively and thoroughly" when it was uncovered. "The University immediately suspended the involved student-athletes from all athletic activities. At the conclusion of its honor code process, the University dismissed four student-athletes and imposed retroactive grade changes in the affected courses." The NCAA says the former student trainer "completed coursework for [two] student-athletes" and that she "provided impermissible academic assistance to six additional football student-athletes in a total of 18 classes." While the Fighting Irish argued that they had demonstrated "exemplary cooperation" by quickly intervening, the NCAA was not impressed. "While the panel commends the institution for acting swiftly and decisively ... removing student-athletes from competition is required conduct for member institutions," the decision-making panel wrote. While Notre Dame might have met its requirements, the panel decided, the university didn't go above the call of duty in a way that would justify waiving the penalty. In the 2012-13 season, Notre Dame went on a 12-0 run but ended "with a blowout loss to the Crimson Tide in the national championship game," the AP notes. The team went 9-4 in the 2013-14 season.